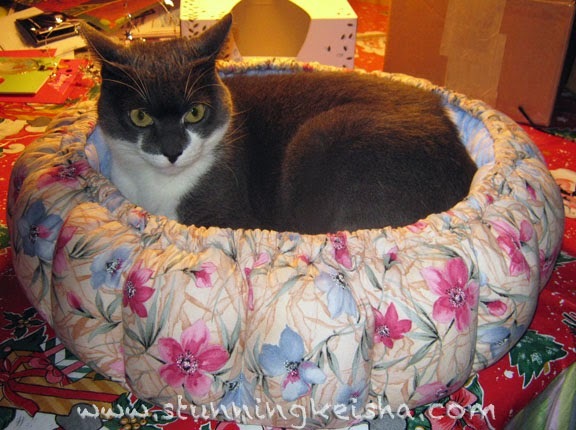 At the December monthly #Nipclub, I won a cool Colorado Catnip bed. I’m not sure that @KingTuttiFruiti didn’t pull some strings cos I really wanted the bed. Heh heh. I have that effect on the men cats. My bed came shortly before Christmas. It’s gorgeous!! I look stunning in it. See for yourself. The peeps weren’t happy cos it smelled strongly of dryer sheets. They were worried about my asthma and whether I was gonna start sneezing. It passed MY stiff test. I apologize for the quality of the video. The room was kinda dark and then Pop tried to pet me during my bed inspection. Sigh! Since the inneresting smell is gone, I don’t go in it anymore. The peeps are hoping that’s just cos I’d rather go into my cozy wooly bed since it’s been so cold. Thanks to #Nipclub, KingTuttiFruiti, Colorado Catnip and, especially Smokey Pino for donating such a pawsome prize. Naturally you have to shun it for a while and make the peeps nervous! Well played, CK, well played. You do look super in it, CK! Concats on your beautiful new bed and have a great Monday! I think that new bed looks really awesome! I'm sure you'll return to it when the weather improves. Love the bed! And of course you look stunning in it, you look stunning in everything! You look warm and cosy there and it sure is fit for a queen. Have a marvellous Monday. That's a good-looking bed, CK! We're sure you'll go back to it once the peeps aren't trying to get you into it. That is a darn cool bed CK! Maybe it needs a nip refresh! That's a pawsome looking bed! And it looks mighty comfy too. We will send you some Ken and Parker fur to strew about the bed. Then you will go for it! that has to be the most beautiful bed ever!!!!!!!!!!! So cute! You look like you approve in the video CK :) It looks like a very soft bed too! CK that's just right on these cold cold nights!! That bed sure looks comfy, CK. And it's just your size! Nice bed, it looks furry cozy and warm. Enjoy! Wow, CK, that bed is almost as stunning as YOU! CK, your new bed is beautiful!!! ...dare I say, STUNNING! CK, we agree, that is one awesome bed! Colorado Catnip are a great Etsy seller and make the most lovely things, I am glad you won it! Maybe Mum could run some catnip on it? It is purrfect for you. Stunning isn't nearly as descriptive a word as is needed for you in that bed! How about breathtaking?????? That's a great bed CK - it's even pretty M says. Maybe you'll like it again later. You know how we cats like to change things around when we are in the mood to do so. Wow, that is a beautiful bed CK! You are looking very stunning in it! What a cool cuddly bed!! It is almost as stunning as yous! That looks like an awesome bed. We have not seen anything quite so fitting of a queen. So there you are - The Queen in her Awesome Bed.